President Hamid Karzai of Afghanistan has offered to provide security for the Taleban's reclusive leader, Mullah Omar, if he agrees to peace talks. Mr Karzai made the offer despite the multi-million dollar bounty offered for the militant leader's capture by the United States. He said that if the US and other Western countries disagreed, they could either leave the country or remove him. There was no immediate response to Mr Karzai's offer from the militants. 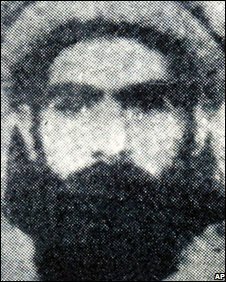 Mullah Omar escaped capture when the Taleban were ousted from power in 2001. Correspondents say there is a growing international debate about whether to negotiate with the Taleban as the insurgents make gains in Afghanistan. "If I hear from him [Mullah Omar] that he is willing to come to Afghanistan or to negotiate for peace... I, as the president of Afghanistan, will go to any length to provide him [with] protection. "If I say I want protection for Mullah Omar, then the international community has two choices: remove me, or leave if they disagree. And both are good. "If I am removed in the cause of peace for Afghanistan by force by them, then I'll be very happy. But if they disagree they can leave. But we are not in that stage yet."